Seeing the resurgence of mystery/detective shows lately, I figured it’d be a good time to dredge up an old favorite from the last turn of century. Karakurizoushi Ayatsuri Sakon, or Puppet Master Sakon, has a very clear identity as classic murder mystery show, in the sense that anyone who can’t stand repetitive cycle of gory corpses, people being spiteful to each other, and tons of scenes with investigators standing around discussing the likes of alibi, motive, and opportunity, shouldn’t come anywhere close to it. On the other hand, those who can’t get enough of that stuff should be able to really enjoy its pure whoddunit set-up that enabled the audience to sleuth along, distinct atmosphere and setting, and a great protagonist in crime-solving ventriloquist Tachibana Sakon. Bonus points if you like puppets, especially the creepy murderous variant. 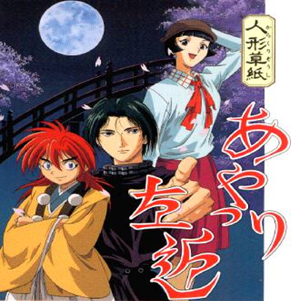 There are eight murder cases in Ayatsuri Sakon, presented as separate story arcs that that last for 3-4 episodes each. It’s very similar structural-wise with Kindaichi Shounen, which also shared a number of familiar whoddunit tropes between them: seemingly impossible scene of crime, multiple victims, oftentimes secluded setting, tragic and elaborate backstory, etc. While there are light-hearted and comedic moments, especially as the number of recurring characters increased, Ayatsuri Sakon is still a primarily dark and chilling series. Murders tend to be very gruesome, there’s constant air of mysticism brought by the recurring theme of Japanese puppetry arts, and Sakon’s trump card as a detective is his ability to channel a deceased victim’s spirit through his ventriloquist puppet/bratty sidekick/alter ego Ukon. Not really a show for kids, this one (*unless they’re weird one like me, who read Agatha Christie around eight or so…). …a tad too generous, perhaps. The murderers tend to be really easy to figure out, as the ample amount of visual lead-on and backstory information often make the whole thing quickly obvious: a very conspicuous zoom of a key object, a piece of info regarding a missing person in the past that fits too well with certain suspect, etc. 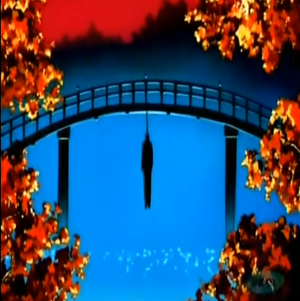 Seven out of eight times, I managed to guess the murderer correctly after the set-up episode at the latest (and in one certain case, just by reading the episode title alone), and it’s very likely that even someone who’s inexperienced with the genre should be able to do about the same just by paying reasonable amount of attention. Fortunately, that predictability doesn’t necessarily condemn this show. I certainly prefer a predictable but fair mystery over ones that pulled off unfair solutions out of thin air, and while it may be a bit of a problem when we’ve already figured out the murderer way ahead of the curve and had to wait impatiently while the characters are still busy freaking out, Ayatsuri Sakon still has other strengths to make up for that. For one, Sakon and Ukon provided the most unique Holmes-Watson dynamic I’ve ever seen. 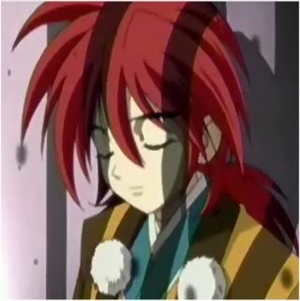 Sakon has a very confident (and often chilling) persona with a complete command over his surroundings whenever he’s wielding Ukon, but his mannerism changed significantly when he’s separated from the puppet. There’s also some great character development work with Sakon as the show gradually reveals his backstory and relationship with various people over the course of increasingly personal later cases. Meanwhile, Ukon is a motor mouth whose personality is a complete 180 from his puppeteer, and they did a great job in selling him as having a ‘life’ of his own. Rounding out the investigation team is Sakon’s lively aunt Kaoruko, who mostly fulfilled the thankless ‘bumbling policeman’ role of wrong hypotheses and jump to conclusion mats, but still a character I found endearing nonetheless and provided many of the show’s comedic moments through her interplay with Ukon. 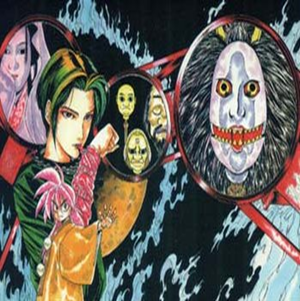 As reflected in Sakon’s catchphrase above, the element of spiritualism that runs deep in bunraku (the art of Japanese puppetry performance) is a prominent theme throughout the story, with Sakon’s revelation acts staged as stylized performance and the culture of puppetry itself being a major recurring theme in majority of the cases. This goes a long way in lending a distinct flavor and personality to the show beyond your typical “genius boy solves murder in random setting” set-up, which is enhanced as well by its strong atmosphere. Adapted from a manga written by Masaru Miyazaki and drawn by Takeshi Obata, Ayatsuri Sakon is brought to the screen with a style that slightly softened Obata’s more gritty design (see picture above), but still packed plenty of punch in many of its moments, a significant part of which is due to the terrific music. Yuriko Nakamura and Norihiro Tsuru composed an array of great mood setting tunes, while Hummingbird’s glorious Yoshiki Fukuyama and Akino Arai lend their great vocals to the OP ad ED respectively, a pair of very fitting songs that also ranked among my all-time favorites opening and ending sequences. It’s a niche show whose traces of its English-speaking fanbase had been fossilized in the form of nostalgic anime shrines and livejournal sites, but Ayatsuri Sakon is a solid and particularly memorable example of its genre. A definite recommendation for card-carrying member of murder mystery fan club, and also those interested in Japanese puppetry culture or just a fan of good character drama/tragedy in general—as long as you don’t actively hate mystery or something like that. I’m not a huge mystery fan, but I have a huge soft spot for this show – and remarkably, that’s not even fueled by nostalgia, since I only first watched it a year or so ago. 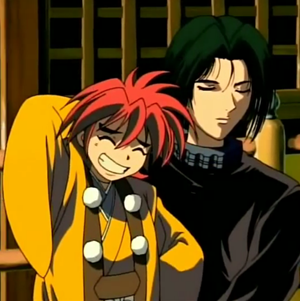 I guess what I am a major fan of is solid characterisation and subtle relationships, and so the whole Sakon/Ukon thing really worked for me… despite (or perhaps even because of) the fact that the latter character is a puppet. Yeah, I came for the mystery, but in the end stayed for the character work with Sakon-Ukon. They’re just great and unique pairing, and that last case was so genuinely moving. Wish there were more of the series. 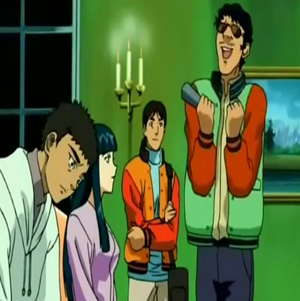 Love how everyone interacted with and responded to Ukon like he’s an actual human being, haha.